The highly anticipated 2018 Winter Olympics will begin on Thursday. Here are the 12 Illinois athletes who have qualified for the Games. .
Bickner, who makes up one-third of the Norge Ski Club’s Olympians, qualified for the Olympics with a high World Cup showing. Even though he didn’t win the U.S. trials to qualify, Bickner was never worried about his status with Team USA. In her second Olympics, Coyne, a Palos Heights native, will try to win an elusive gold medal after taking silver in 2014. The 25-year-old helped the U.S. team win gold at the 2017 World Championships. Davis comes into Pyeongchang as one of the most decorated athletes in Chicago sports history. Owning two gold and two silver medals, Davis will seek his fifth Olympic medal at his fifth Winter Games. Tennell, who has a shy personality, will have to get used to the media as an Olympian. Evans picked up the sport of bobsled in 2012, after competing in track and field in the shot put throughout. She graduated from Morgan Park High School and the University of Illinois Champaign-Urbana. Gehring, a Glenview native, won bronze at Vancouver in 2010, but failed to make the team for the 2014 Olympics. After missing the team, she almost retired from the sport, but came back to oval in 2017. Glasder wrote history by becoming the first ski jumper from the Norge Ski Club to qualify for the Olympics after winning the U.S. trials in late January 2017. The Cary native began ski jumping when he was 5-years-old. Hansen, a silver medalist in 2010, took two years off from speed skating to focus on his future, and finished his degree in business. In Pyeongchang, he’ll be competing in his third-straight Olympics, hoping to add another medal. Although it says on teamusa.org her hometown is Sun Valley, Idaho, Knight grew up in Lake Forest, and is the face of the U.S. women’s hockey team. She’s a three-time Olympian and a two-time silver medalist. 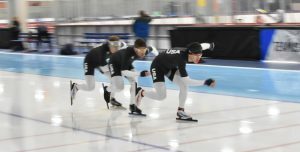 Considered a rising star in speed skating, Lehman will compete in his second Olympics after winning the 5,000-meter race at the U.S. Championships. The Oak Park native is replacing Shani Davis on the U.S. Team Pursuit squad. Emery Lehman (front), Joey Mantia (middle) and Brian Hansen (back) make up the 2018 U.S. team pursuit squad. The youngest member of Team USA hails from Barrington, as well as the Norge Ski Club. He placed 11th on the team large hill in the 2017 International Ski Federation World Cup, and can be considered an up-and-comer in the ski jumping community. The only mixed pair figure skating couple the U.S. is sending to South Korea also happens to be a husband and wife duo. Scimeca-Knierim, an Addison native, will skate with her husband, Chris. Maybe the biggest surprise leading into the Winter Games, Tennell, a Carpentersville native, won the U.S. Championship in early January. A medal performance in Pyeongchang will cement her status as the future of U.S. women’s figure skating.